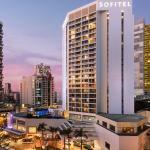 Visit the Sofitel Gold Coast in Broadbeach for an extra splash of creativity. 19 Karen Contemporary Artspace has partnered with Sofitel Gold Coast Broadbeach to bring remarkable artwork into the public arena that will inspire, challenge and provoke your senses. 19 Karen is thrilled to announce we have partnered with Sofitel Gold Coast Broadbeach to bring you remarkable artworks by an exciting range of Australian and International artists. Sofitel Gold Coast Broadbeach offers 5-star luxury accommodation in the heart of Broadbeach, just a few steps away from the beach. Created with the philosophy that authentic experiences and smart design are vital to today’s global nomad, Sofitel Gold Coast Broadbeach was designed so guests can personally connect with their surroundings and each other in locally inspired luxury, style and sophistication. Sofitel Gold Coast Broadbeach offers a distinctive selection of restaurants and now also presents beautiful artwork on their walls.